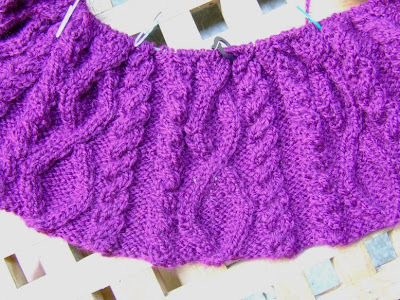 First things first: I'm currently on the 39th row of the peplum of Purple Belle. On the other hand, I haven't touched the MS3 at all... There was no time, because apart from resting and having fun we had to prepare the feast, and I've been scribbling in my art journal, both subjects deserve separate posts so expect them soon (I'm not sure about today because I'll be busy all day and in the evening I'm meeting Anna for wine and ice-cream, yummy! *^v^*). Your sweater looks great so far-and like you i love the color! i think the finished sweater will be beautiful! Don't worry about MS3 you were off having a great time and thats all that matters!